We humans have much to be proud of. We have cured many diseases and also developed ways to avoid getting sick in the first place. We have created beauty in art and music. We have plumbed the depths of the ocean and climbed the highest mountains. And not only have we mastered flight, but we have used it to visit other celestial bodies. And we owe much of these achievements to our intelligence. So what would you do if you met creatures even smarter than us? Members of Cetacea - dolphins and whales - have a larger brain to body mass ratio with more folds in their cranial tissues than humans. Much of this extra mass is in the communications center. So while we value our rich languages, Flipper communicates on levels we cannot even comprehend and can do so over enormous distances. Take a hunting pod of false killer whales for example. They spread out over many miles working as individuals until word gets out of a hunt in progress. Suddenly 4 or more whales will show up to join in the kill. How dolphins and whales communicate information over miles of ocean with clicks and whistles has been the subject of many PhD dissertations. We still have little idea what they’re talking about. 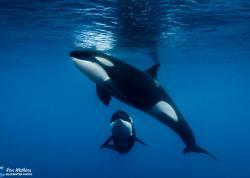 No other animal has the ability or intelligence to impart such a sense of awe as a whale or a dolphin. Even when viewed from the surface, the power of a diving humpback or the intense energy of a dolphin in play can be overwhelming. Swimming with large, sentient and often predatory animals means we must play by a special set of behavioral and legal rules that most other reef organisms don’t require. As a disclaimer, no other aquatic animal enjoys the same protections as marine mammals. The Marine Mammal Protection Act covers all marine mammals in the United States, and some are afforded additional special protections. While it is recommended that divers read this act in its entirety, the gist is that divers, swimmers, and boaters may not intentionally approach a marine mammal in such a way that it alters that animal’s behavior. Most of the battle of photographing marine mammals lies in finding a photogenic subject, and much of that depends on how you interact with them. It is best to think of dolphins and whales as intelligent animals. For example, dolphins and whales must rest and do so by using half of their brain at a time. Approaching a resting marine mammal is not recommended. It is akin to waking one of your sleeping neighbors in the middle of the night. They are just going to awaken grumpy, tired and just want to be left alone. It is best to find a tour that specializes in whale and/or dolphin encounters with people who can read the animals’ behavior. These animals can swim MUCH faster than you, and any wrong move might cause them to swim away or worse, react defensively. It is important to conduct yourself appropriately in a non-aggressive manner so as to not spook them. For starters, it is always best to let the animals approach you and let them decide how the encounter is going to go. Behaviors such as tail slapping are often signs of aggression, so it is important to keep your fins from splashing. Rotating your body such that the fin strokes are horizontal and the fin tips never break the surface is a good start. Furthermore, do not swim with your hands. The less splashing the less intimidated the animal will likely be. Turn your strobes off for these encounters. Don’t ever try to touch a wild animal. Finally, always watch for signs of aggression. Tail slapping, blowing bubbles, jaw gaping and any other strange behaviors can be a sign that you should leave the animal alone. Dolphin and whale intelligence is precisely what makes interacting with them so interesting. They cannot be baited and they don’t visit cleaning stations. The best and only legal way to interact with cetaceans is to gain their trust and arouse their curiosity. You can start from the surface by whistling or clicking when the animals come up to breathe, listening as they often mimic you back. You might try diving down and balling up or spinning or flipping underwater- anything you can do to appear interesting and playful. 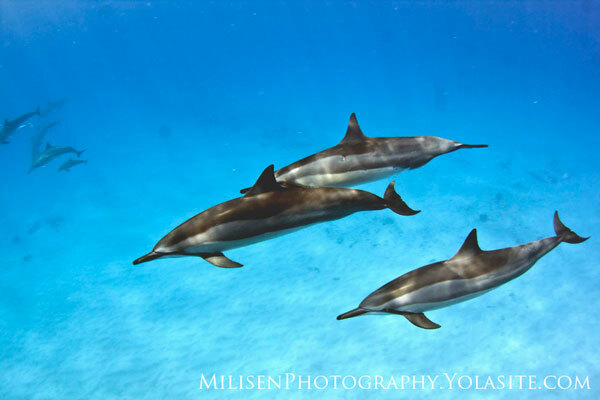 Hawaiian spinner dolphins play a game of “pass the leaf,” and will often let you join in if you bring your own leaf. Other dolphins enjoy mirroring, or mimicking the way they behave. 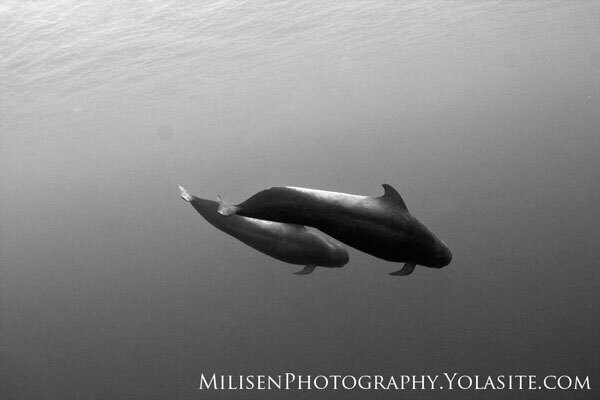 It is a good idea to have two cameras for marine mammal expeditions. The first should be a topside, dry camera with a long lens (100mm or more) to capture the animal surfacing, breaching, spy-hopping, or any other interesting interactions with the boat. A super fast shutter speed will help freeze the action. Creative opportunities abound from the surface. 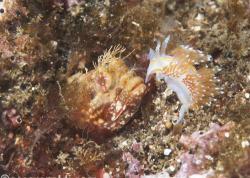 A second camera, in an underwater housing, should be fitted with a wide-angle lens. I always recommend the Tokina 10-17mm lens for wide underwater work. It has beautiful color rendition, focuses very fast and has excellent sharpness. The fisheye effect is not noticeable underwater where few straight lines exist. For the underwater rig, I usually use a shutter speed of 1/160 or faster to capture the action. While most underwater photography articles will encourage you to shoot up at a subject, that isn’t always the case with marine mammals. In many cases, diving underwater will scare the animal away and often shooting down will better capture the background scenery of a coral reef or sunrays filtering through the depths. As far as framing, the old adage of “get close, then get closer” is a little skewed. Because the animals glide so much faster than you can swim, getting close is a matter of timing when to pull the shutter. Also, try to capture the animal looking at you, as a successful interaction will allow for lots of photos of the animal actively investigating your camera. 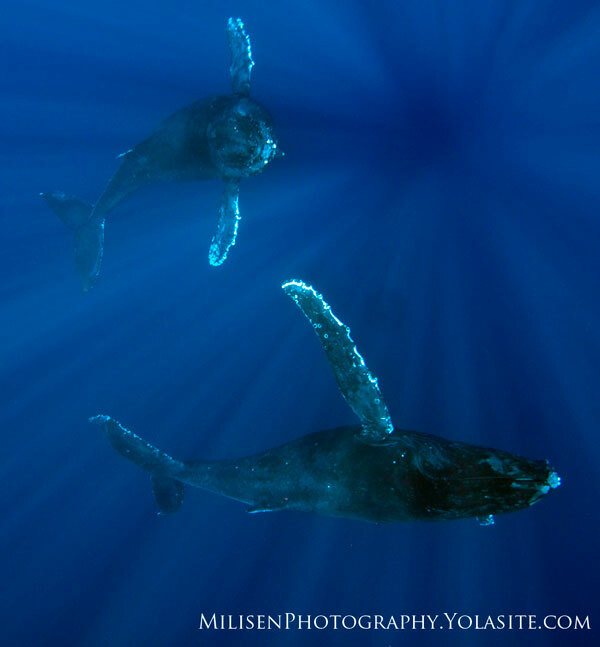 Humpback whales are among the largest marine animals that have ever existed and must be treated with extra respect. Often, the best interactions will be from a boat, dangling your camera over the gunwale if they swim in close enough. Pilot whales are capable of diving thousands of feet down in search of their favorite prey - squid. They are best approached when lazily “logging” at the surface. Be on the lookout, however, as another ocean predator often accompanies pilot whales... oceanic whitetip sharks. 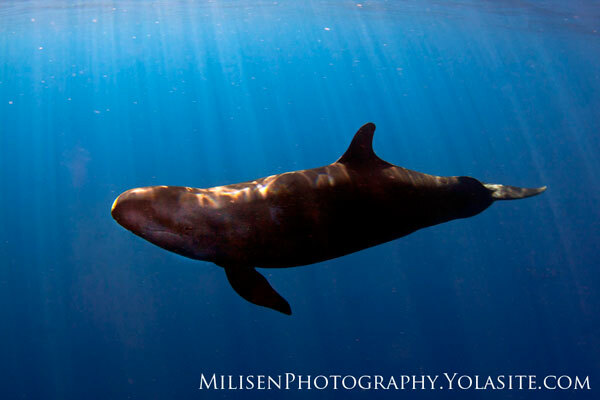 False killer whales are a special kind of mammal. They cover an enormous amount of ground in a short amount of time and must constantly be hunting. 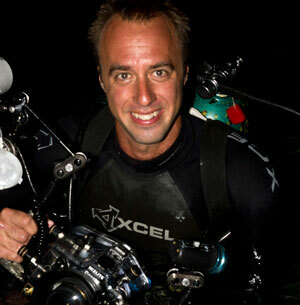 They are equally adept at hunting epipelagic tuna, reef-dwelling jacks and deep-water snappers. Their hunger also makes them a frequent victim of longline bycatch. This animal is a member of the Hawaiian insular population, of which an estimated 125 animals remain. Offshore dolphins portray their personalities in unique ways. 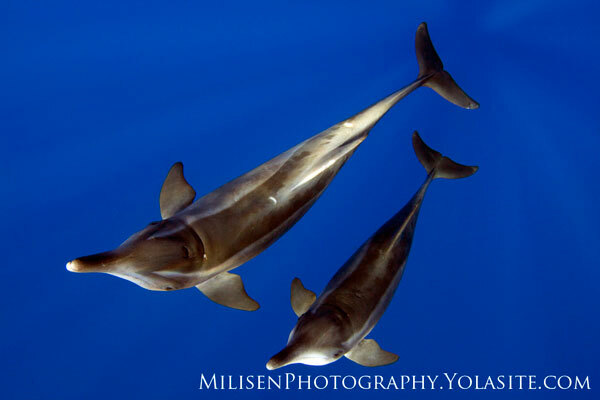 Rough-toothed dolphins have a certain prehistoric look and don’t often encounter freedivers. They can become quite curious, using their extra-flexible neck to investigate newcomers to their environment. They are also one of the main enemies of tuna fishermen, capable of filleting a caught fish while it is still on the hook. There is no surefire way to guarantee a marine mammal is going to take an interest in you. As intelligent as they are, marine mammals have moods and sometimes they just don’t want to play. But when everything aligns properly, marine mammal encounters can be one of the most enriching encounters a diver can experience underwater. Want to Dive with Dolphins and Whales? 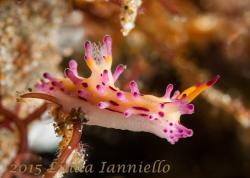 Bluewater Travel can help you plan and book the perfect big animal dive trip. Visit BluewaterTravel.com for more info. Canon T1i with Tokina 10-17 fisheye lens in an Ikelite housing.